How seven salons use indulgent pedicure services to increase their profits. Whether she’s a high-powered executive or a busy soccer mom on the go, your client loves a little extra attention. You can be her fairy godmother and increase your bottom line, all at the same time. 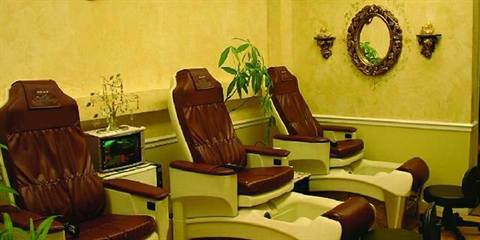 NAILS visited seven salons to explore their most profitable pedicure services. Everyone — from frazzled clients who walk out serene and glowing, to technicians who enjoy pampering tired legs with customized massage strokes, to owners who see their customer base and profits rising — lives happily ever after. This signature service is the crème de la crème of Charles Penzone’s pedicure offerings. 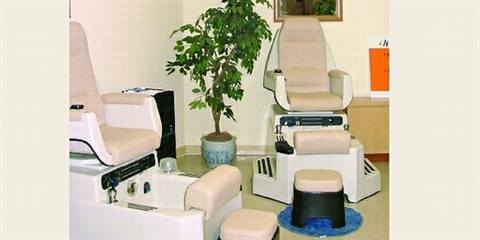 In a quiet, custom-designed environment, technicians restore order to busy feet and then exfoliate legs and feet before treating the client to an energizing massage. Clients choose from a paraffin dip or cooling marine mask and leave with perfectly polished toes, and feet and legs that have been recharged and rehydrated. Fingers, Faces and Toes at Cactus, Plainview, N.Y. 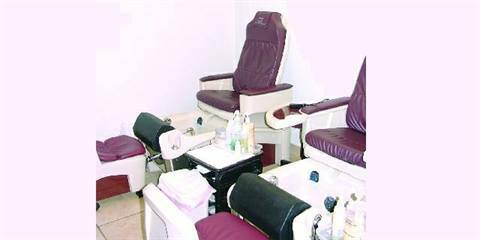 Located on the lower level of a bustling, full-service salon, this independent nail care salon is a peaceful, clean, and nearly silent oasis for achy feet. After choosing a color from the salon’s collection of professional polishes (reds and soft pinks are featured), clients who pick the Spa Pedicure are quietly groomed by Sue, who clearly enjoys her work. The service includes a warm, fragrant soak, nail and cuticle care, refreshing scrub, and a massage that moves from whisper-light strokes to musclerelaxing pressure and back again. With legs and feet now soft and smooth and nails polished and dried, clients can relax in the roomy waiting area until climbing the stairs to re-enter the real world once again. Cactus Salon and Day Spa, Syosset, N.Y. Although all the salons featured were quick to emphasize their attention to cleanliness and sanitation, the technicians at Cactus Salon and Day Spa opened up their cupboards, showing the cleaning products and demonstrating their techniques. Clients here needn’t worry about these things and can instead concentrate on saying goodbye to tired, achy feet and sore calf muscles. “All of our services are excellent,” explains pedicurist Harriet Saviano, “but this is very popular and a wonderful way for women to pamper themselves.” Creative Spa products are used exclusively, beginning with Sea Rock Soak. An alpha-hydroxy callus spray and pumice rub softens the rough spots, and additional treats include silkening massage oils, Marine Masque, Cucumber Heel Therapy, Sea Salt Glow, and Marine Gel. Tips to Toes 4U, Hicksville, N.Y. 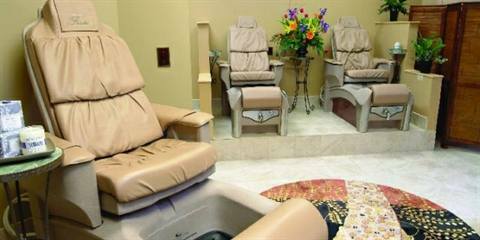 Hot Stone Therapy Pedicures are the buzz all over Long Island, and for good reason. At this well-liked local salon, this soothing one-hour treatment is a big winner all around. Legs are refreshed with a cooling cucumber mask while the toenails are groomed. Next up — a soothing and surprising arm and hand massage with OPI Berry Juicie antioxidant lotion. But the legs and feet are in for a series of treats: a warm oil massage, followed by an even longer acupressure session with warm basalt stones (that make a gentle “clack-clack” as they meet), and an exfoliating scrub. Calluses and rough spots are banished, nails are polished, and just when clients think the fantasy is over, they’re given a neck, shoulder, and back massage while their pretty toes are under the dryer.